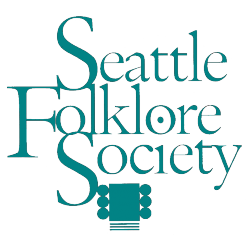 The purpose of the Seattle Folklore Society is to preserve and foster awareness and appreciation of folk and traditional arts in the Seattle area. Our non-profit folk organization, founded in 1966, has one of the largest and most stable memberships in the country. We produce folk music concerts, dances, song circles, camps and a newsletter, the SFS Flyer. Many of our members are active concertgoers, dancers and players of the acoustic guitar, banjo, fiddle, mandolin, dulcimer, ukulele and other folk instruments. The SFS is a member of Folk Alliance. The SFS Flyer – one of the benefits of becoming a member – is mailed to about 1,000 members, most of whom are in the Puget Sound area. It contains information on upcoming Seattle Folklore Society concerts, song circles, dances, and volunteer opportunities. A monthly calendar of events around the area, free members’ ads (the “Unclassifieds”), and articles complete the Flyer. Are you promoting a folk concert, dance or other event of interest to our members? Tell us about your event. Event information is due by the 15th of the month prior. The SFS Flyer, which is sent to all our members, comes out on the first of the month and includes an extensive event calendar. The online event system is the preferred way to submit events for the SFS Flyer. You must register with the system to submit an event, but there is no charge for this. If you have written an article of interest to our members, submit it by email to flyer@seafolklore.org. Articles are due by the 10th of the month prior. If you have questions or want to reserve advertising space, or for general Flyer information call the flyer voicemail at (206) 782-0505, or send email to flyer@seafolklore.org. You can email change of address information to members@seafolklore.org. The SFS concert committee produces many folk music concerts each year. You are invited to come to a concert committee meeting the first Monday of most months at 7pm in Seattle. Email us or leave a message on the concert line at (206) 923-8923 for the location of the next meeting. We love to have drop-in guests, even if you are just interested in seeing what it takes to produce a concert. We have a compilation CD (produced in 2000) available of some of our favorite Northwest folk acts. We are always reviewing music. Types of music that we have produced have included traditional singers, singer-songwriters, instrumental soloists, and instrumental ensembles from the USA and many regions of the world. Performers, see our performer info page. The concert committee has its own voicemail line to request more information and hear descriptions of upcoming shows: (206) 923-8923, and an email address concerts@seafolklore.org. To receive e-mail notification of upcoming concerts, join our mailing list. All tickets are currently sold in advance through Brown Paper Tickets. or at prior SFS concerts, with many concerts having tickets still available at the door. Active since the ’70’s, Seattle Song Circle meets every Sunday night in various homes to swap songs. Participants may sing, request a song, or just come to listen. This group is known for its “phunny” sense of humor, but even more for its members’ wide-ranging knowledge of folk songs, many of whom actively research special areas of song. Song Circle is held every Sunday evening in a living room around Seattle. First and Third locations are fixed, other Sundays vary. For more information by email contact songcircle@seafolklore.org. The archives contain regional information on song circles in the Northwest. Rainy Camp is a successful song camp supervised by a small committee whose active seasons are Fall and Winter. The Camp, is held at Lake Retreat, Ravensdale WA the last weekend in January. It features numerous singing workshops on many themes, including ballads, sing-alongs, work songs, and instruction/performance. For more information, see the Rainy Camp page, or call Bruce Baker, Committee Chair, at (206) 783-6824, or send email. For information about jam sessions, email jams@seafolklore.org, or see our page on places to play folk music in the Seattle area. Contra dances and English country dances are held regularly. The calendar published monthly in the SFS Flyer shows the schedule, or check out our Dance Resources page. Call our general SFS line at (206) 782-0505 for the latest info, or consult the invaluable Seattle Folk Dancing web page. Email questions to dance@seafolklore.org. National folk dance info is available from the Country Dance and Song Society. The Seattle Folklore Society sponsors the Fifth Saturday Dances, the Emerald City Contra Dance, and the Seattle Family Dance.